Financial Repression: Invisible Taxation, Surprise Inflation and Confiscation of Gold? What is financial repression in a nutshell? Financial repression is invisible taxation which erodes the purchasing power of individuals via inflation. "By a continuing process of inflation, governments can confiscate, secretly and unobserved, an important part of the wealth of their citizens. 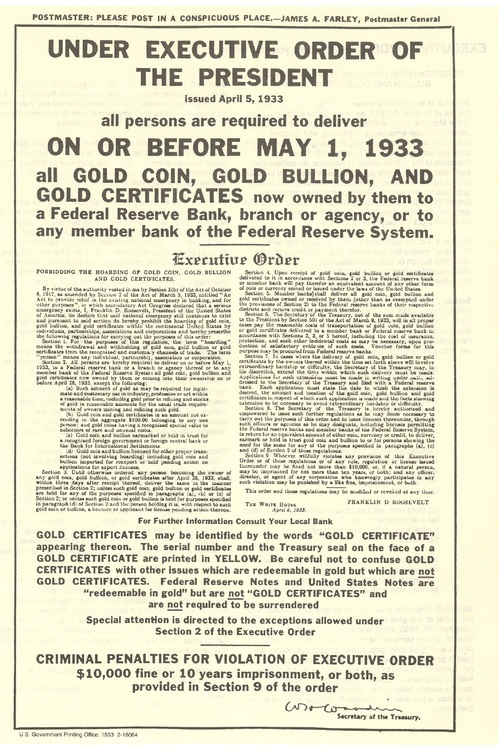 By this method they not only confiscate, but they confiscate arbitrarily; and, while the process impoverishes many, it actually enriches some..." wrote Lord Keynes in The Economic Consequences of the Peace in 1919, in the aftermath of the Treaty of Versailles that followed the First World War and delivered "Carthaginian peace" sowing the seeds for the second global conflict within two decades. In many advanced economies around the world, we appear to be neither in a simple recession and nor in a depression but in a financial repression, which is a subtle type of debt restructuring. The term "financial repression" was originally introduced in the works of Shaw and McKinnon in 1973. Advanced Nations In The Same Boat? This ATCA 5000 briefing looks into the current phase of financial repression around the world -- especially amongst the advanced countries -- and its implications for government debt, inflation and across asset classes. The timing of this Socratic dialogue seems appropriate, as the debt level for advanced economies continues to surge to absurd levels after the financial crisis. In all the previous instances of high debt, a period of deleveraging has ensued, with events of default, financial repression, inflation, surprise inflation spikes and hyperinflation. The attached chart gives the periods of surges in debt in advanced and emerging economies over the last century. Are policymakers around the world using the strategy of financial repression once again to control government debt in their countries? Yes, this would appear to be the case given that in recent years, policymakers have been repeatedly resorting to inflation targeting, and financial repression necessitates a steady dosage of inflation. This appears to underscore the point that financial repression is being used as a method to reduce the national debt to GDP levels and/or to reduce the national debt servicing cost. If history were to repeat itself, the world is likely to witness continuing defaults, financial repression, inflation, surprise inflation spikes and hyperinflation over the next decade. 1. There is an indirect cap on government bond yields through extensive Quantitative Easing (QE) via bond purchase programmes, which have been recently expanded and extended yet again. Record low yields on long-term government bonds are a direct result of the printing of money by major central banks and their associated bond purchase programmes. 2. It is increasingly evident that there are more domestic buyers of government debt in the aftermath of the start of the global financial crisis in August 2007 which set an unprecedented milestone with the collapse of Lehman Brothers in September 2008. The national central bank authorities and domestic players have now become amongst the largest buyers of their own government bonds. 3. Whilst there is no case of the government sector owning large banks outright, however, government regulators in advanced economies have focused on extensive management and oversight of banks and other financial institutions. "Historically, periods of high indebtedness have been associated with a rising incidence of default or restructuring of public and private debts. A subtle type of debt restructuring takes the form of "financial repression." Financial repression includes directed lending to government by captive domestic audiences (such as pension funds), explicit or implicit caps on interest rates, regulation of cross-border capital movements, and (generally) a tighter connection between government and banks." "We have argued that inflation is most effective in liquidating government debts (or debts in general), when interest rates are not able to respond to the rise in inflation and in inflation expectations. This disconnect between nominal interest rates and inflation can [also] occur if... all (or nearly all) debt is liquidated in one 'surprise' inflation spike." Some distinguished members amongst the ATCA 5000 are of the opinion that "surprise inflation spikes" are one of the options for the policymakers of advanced economies in order to liquidate large tranches of debt in the near future. Would it then be surprising to see high double digit inflation in the advanced economies in the coming decade with the sole purpose of liquidating debt per the step-by-step ratcheting of the financial repression scenario? 1. Mixed Financial Repression? The problem with a steady dose of inflation, surprise inflation and artificially low interest rates is that it punishes the savers and the middle class. However, on this occasion the outsourcing of manufacturing and services to China and India -- amongst other emerging nations -- is helping to keep a somewhat better lid on inflation than was witnessed during previous "financial repression" regimes. 2. Demand Destruction? The massive rise in youth unemployment, the stubborn refusal of the general unemployment rate to go down swiftly, and negative equity associated with house prices, is also dampening demand which translates into lowering prices or causing "deflation vectors" via demand destruction. For these reasons and many more, including the quadrillion dollar derivatives pyramid, the consequences of "financial repression" appear to be less aggressive than would be the case if one looked at the absolute amounts of quantitative easing carried out in trillions by the central banks of advanced economies. 3. Youth Insurrection? The "Jasmine Revolution" in the Middle East via "Self-Assembling Dynamic Networks" was ignited by high food and fuel prices caused by the first round of quantitative easing. Let us not forget that "financial repression" has enormous consequences for rocketing food and fuel prices around the world which may yet again become precursors to further civil unrest and youth insurrection. 4. Direct Default? A steady dose of inflation creates a prolonged period of invisible taxation, lowering the standards of living and purchasing power for most average households caught in the midst of "financial repression" by stealth. From that perspective, a better option to get out of the inescapable debt trap may be to default directly and not default through steady inflation. This was the case with Iceland and may eventually be the case for certain peripheral Eurozone countries such as Greece, Portugal and Spain because the "euro" currency may remain exalted for longer than their export businesses can remain solvent. However, outright default is certainly not the option policymakers would want to implement in advanced industrial economies unless things become much more severe in the shape of another global financial crisis caused by the manifestation of multiple unknowns unknowns or black swans.